This is the first book to systematize the philosophical content of Thomas Jefferson’s writings. Sifting through Jefferson’s many addresses, messages, and letters, philosopher M. Andrew Holowchak uncovers an intensely curious Enlightenment thinker with a well-constructed, people-sympathetic, and consistent philosophy. As the author shows, Jefferson’s philosophical views encompassed human nature, the cosmos, politics, morality, and education. Beginning with his understanding of the cosmos, part one considers Jefferson’s philosophical naturalism and the influence on him of Francis Bacon, Isaac Newton, and John Locke. The next section critically examines his political viewpoints, specifically his republicanism, liberalism, and progressivism. The third part, “Jefferson on Morality,” analyzes Jefferson’s thoughts on human nature, his moral-sense theory, and his notion of “natural aristoi” (best or most virtuous citizens). Finally, “Jefferson on Education” reviews his ideas on properly educating the people of the new nation for responsible, participatory citizenry. 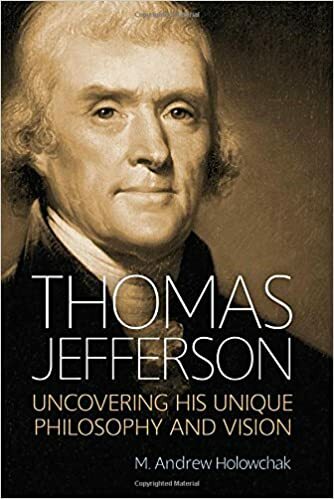 Jefferson conceived of the United States as a “great experiment”—embodying a vision of a government responsibly representative of its people and functioning for the sake of them. This book will help readers understand the philosophical perspective that sustained this audacious, innovative, and people-first experiment.